I was talking to a couple on the patio of a downtown bar. The lady wanted me to give her husband some style advice. The husband wanted to get some “trendy” looks for cheap. I told him how I recently went to JCP to pick something up, and ended up finding some fashion pieces that I wanted. I decided to see if I could get a similar look at two ends of the retail scale. I decided the clear choice was comparing Saks and JCP. It was bit of a challenge, but I was able to pull together a look that is perfect for an afternoon urban adventure. The first look comes from Saks. The look is a casual relaxed look with a bit of urban mix. I tend to favor a black or grey color pallette, but this spring I’ve branched out into deep blue shades. (I know – it’s a huge step.) I secretly put together the dream outfit I wish was in my closet right now. Set aside $1,763 for this look. What I like best out of this look is a toss-up. It’s pretty much a tie between the cargo pant, shirt, and backpack. J Brand has been really knocking out some dope looks in guy’s pants. I like the tailoring and their cargo take of the pant. This look is all about the details. A great pop of color comes from the always funky Paul Smith sunglasses. The key with embracing a camo pattern is to use it in moderation; it’s a great, bold way to incorporate some pattern into the solid colored look. It clearly was easy to create a trendy look using product from Saks. The challenge came when I began searching JCP for something similar. For this look, the key things to remember are: keep it simple and focus on the details. I never really thought of the newly re-branded JCP as a regular stop in my shopping plan. Frustrated by not finding anything at Greenwood Park mall, I decided to check it out. I knew it would be a challenge to pull together a look like the one I picked out from Saks. The entire JCP look can be purchased for $111. Granted, the chino trouser is a lot more basic, but a classic trouser is an item that can last multiple seasons. The shirt and stripped shirt combo is a good way to add a bit of pattern to the outfit. During the summer, guys should embrace unique eyewear options. Glasses are a great way to add style to a basic outfit. 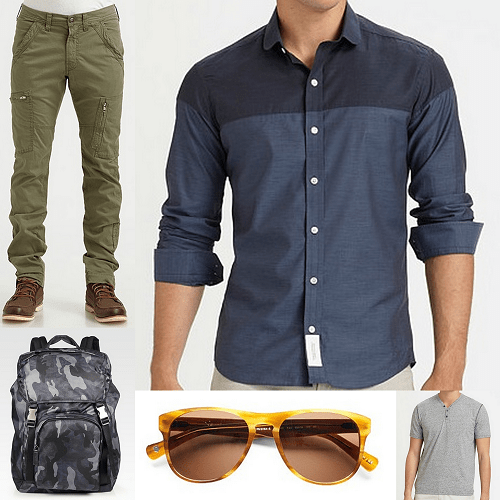 Altogether, the look is a cool casual outfit for a weekend urban adventure. I’m almost positive my last purchase from JCP was back in middle school. I was pleasantly surprised at some of the stuff I saw in the men’s department. Don’t get me wrong – I saw a lot of items which I’m sure JCP is the only supplier. And, I’m pretty sure the denim pleated front cargo pant is best left off the sales floor. I did find some patterned bow ties, cotton colored shorts, and some decent pattern button-front shirts. I was shocked to get these items marked off my list. The only thing to be cautious when shopping at JCP is to take advantage of the fitting rooms. I found the sizes are a bit different, and even though the pant is listed as slim fit, doesn’t mean it fits like one would expect. 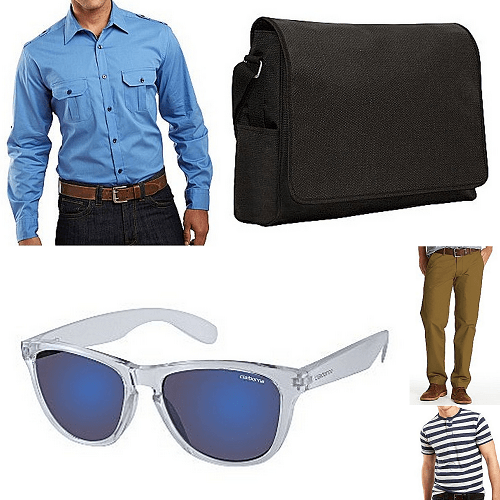 The plus side is, if you take out the messenger bag, you can easily put together a styled look for under $100. Just a way to show that you can put a styled look together almost anywhere. It just takes a bit of extra work.